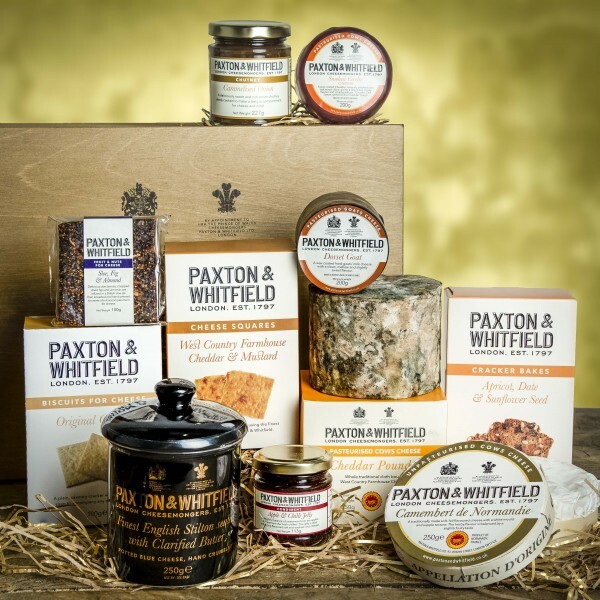 An exciting collection of Paxton & Whitfields finest treats, packed into a classic wooden hamper box. A selection of five of Paxton & Whitfield's own cheeses accompanied by a sumptious range of accompanying preserves, biscuits and sweet treats, presented in a traditional wooden hamper box. Empty wooden hamper box with a Paxton & Whitfield embossed lid. Perfect for creating your own bespoke hamper. Dimensions of the hamper with lid on: 37cm length, 28.5cm width, 21.5cm height. This chutney offers a full bodied sweet and piquant flavour and is ideal when served warm or cold with cheese or meats. The rich flavour is achieved by slow cooking and the choice of ingredients.